Car Boot Sale Treasures #Infographic ~ Visualistan '+g+"
We recently heard the news about a stunning find at a car boot sale in the United Kingdom. What was thought to be a piece of costume jewellery was purchased for just £10, however it has since been discovered that the costume jewellery diamond is actually a real diamond and is expected to fetch £350,000 when it goes on sale next month. This got us wondering if there where any other examples of treasures bought at car boot sales that actually went on to make their new owners a tidy profit when they sold their finds. 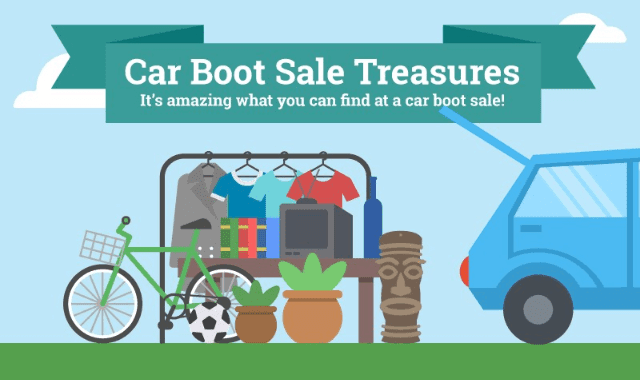 We also take a look at items which may be hidden away in your loft or indeed for sale at other car boot sales that can also earn you a small fortune if you can pick them up for the right price. An example of which is an original working sony walkman from 1979 which can fetch an impressive £422.